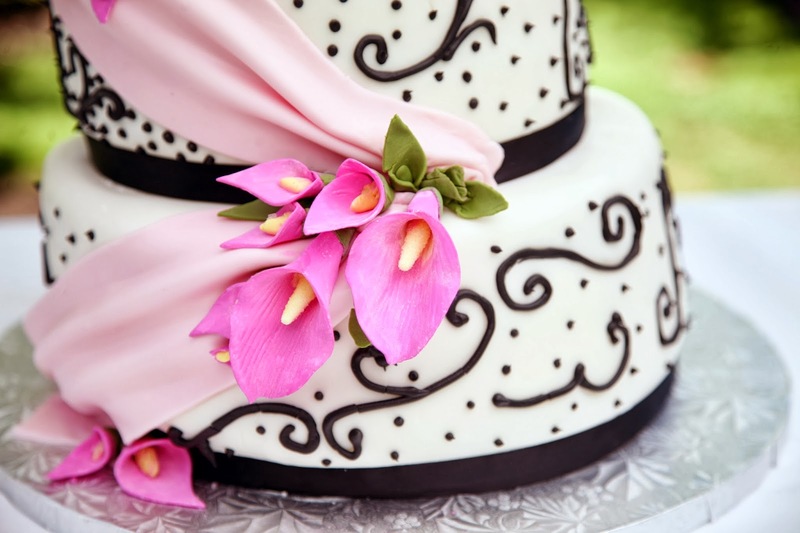 Ask these eleven questions of your prospective wedding cake baker to ensure there are no unwelcome surprises on the day of the wedding (or after). Do you have a portfolio that I can review? This can give you a quick feel to see if you like their style. Some bakers calculate the pricing per slice...others charge based on the time to design the cake. Also, some charge extras for embellishments, and most bakers charge extra for premium flavors and frosting. Are there additional rental fees? Make sure you understand all fees upfront before booking the baker! What are my options for personalizing the design? Check to see if they can create a custom design based on photos you provide of other cakes you admire, or details from your dress. What are my options for flavors, frosting, filling? Make sure you get specific pricing for each. Can you create cakes for special dietary needs? Can they make cakes that are kosher, vegetarian, vegan or gluten-free? When is the cake prepared? The fresher the cake the better! How will my cake be delivered? What is your return policy for the cake stand(s)? Make sure you know the date these items need to be returned by, then assign this job to someone to take care of while you are away on your honeymoon. What is the deposit required and when is the balance due? Make sure you find out if the deposit is refundable in the event of a change. Do you preserve the top tier for my first anniversary? As with any other wedding service, make certain that you have a written, signed contract with your service professional that details the agreed upon price and any other extra charges that might come into play. Check out the gorgeous wedding cake tops at WherebridesGo.com!